Horridus enjoys watching the hyper-violent cartoon Guy & Duder but is interrupted by repeated scratching at the front door. She opens the door to the Maxx who is searching for his friend, Sarah James. Horridus states that she is no longer scared of the hero and invites him inside to watch the television with her. The revelation that Rapture is pregnant gradually sinks into Dragon’s mind but he asks her if she is sure that he is the father. Dragon’s accusation of cheating enrages Rapture who demands that he leave the apartment immediately. As he slinks out, Dragon is shocked to find the Maxx in his home making sandwiches with Horridus. A nameless sorcerer is approached by the Fiend who declares that speaking with numerous people regarding contacting the Devil. This man reveals that the entity that shares her body is familiar with the Devil but the Fiend dismisses her partner as useless in this regard. The Fiend wishes to send Dragon to Hell and is willing to sell her own soul in order to achieve her goal. The Maxx and Dragon find themselves in the Outback but this mind landscape is different to any Outback that the Maxx has visited before. He soon realises that he is in Dragon’s mindscape where they come under siege by an army of children, the male all resembling Dragon while the female all look like Rapture. This army is aided by a giant Rapture but Debbie Harris arrives on the scene to lend a hand before she is once again shot in the head. The heroes struggle to repel the attack by the kids until they are suddenly snapped back to reality. Sarah James finds both Dragon and the Maxx up a tree with numerous dogs at the base, barking at them. 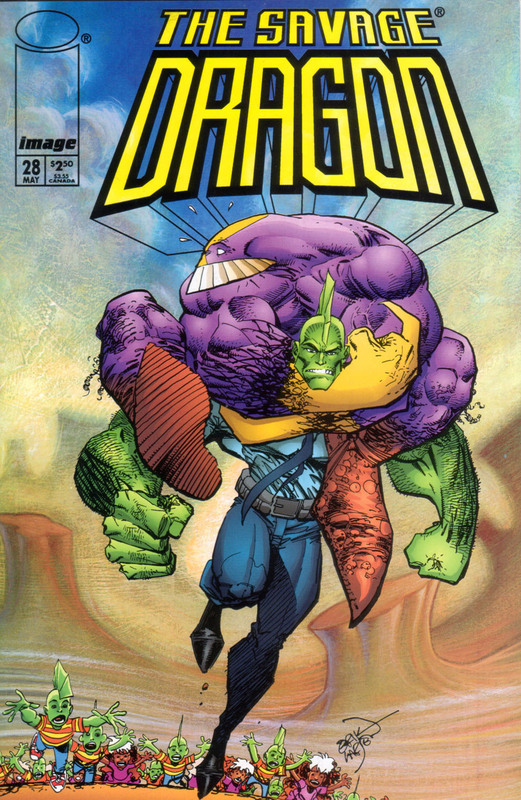 The Maxx is led away by his friend while Dragon struggles to come to terms with the strange events that have unfolded. At the new Donut-A-Rama headquarters of Freak Force, Rapture walks in on Dart lying asleep with Justice in bed. She catches up with Barbaric and Ricochet before noticing Dragon walking through the building with Ann Stevens. Rapture hears their conversation which involves Ann taking Dragon to Hillman Hospital to “get it up” and that it is not “his first time”. BrainiApe is in the process of robbing a bank when he is disturbed by PowerHouse who is furious over his colleague’s actions. The Vicious Circle had not given permission to BrainiApe for this criminal act and it is pointed out that CyberFace could drain the bank of its finances from afar. PowerHouse is attacked by BrainiApe but manages to fend him off. He smashes the protective jar around his foe’s brain and is thanked by the occupants of the bank for saving their lives.